Located in the southernmost area of Spain, in the Cadiz province and the Andalusia region of the country, Tarifa is a small town known for its beautiful beaches and beautiful scenery. Tarifa is also known as being a great location for wind sports, such as sailing, kite flying, and windsurfing due to its regular windy days compared to other parts of europe. While originally established as a fishing town, Tarifa has grown into a vacation wonderland for families and couples, with plenty of things to do, see, and a variety of places to eat and stay. From sandy, warm beaches, to whale watching expeditions, Tarifa is the perfect place for tourists. Tarifa is a small coastal town located in southern Spain and spans across ten kilometers of beautiful warm beaches and lush green countryside. It is located in the Costa de la Luz (Coast of Light) and is across from the Strait of Gibraltar. Since Tarifa is believed to have been a Roman settlement, some ruins of the beginnings of the city can still be seen throughout, such as the Village of Bolonia, which was a Roman city located near the town of Tarifa. Along with Roman ruins you can see other landmarks such as the old Castle of St. Catalina and the Gothic style Church of St. Matthew. What is the weather like in Tarifa? Tarifa has a Mediterranean climate, with hot, dry summers and mild winters, with the majority of the rain for the year occurring during the winter season. Because Tarifa is close to the ocean the rainy season tends to bring a lot of precipitation. In winter, temperatures can range from eleven degrees Celsius to twenty-two degrees Celsius (about fifty degrees Fahrenheit to seventy degrees Fahrenheit), while in the summer, temperatures tend to range from about twenty degrees Celsius to thirty-eight degrees Celsius (roughly sixty-five degrees Fahrenheit to one hundred degrees Fahrenheit). 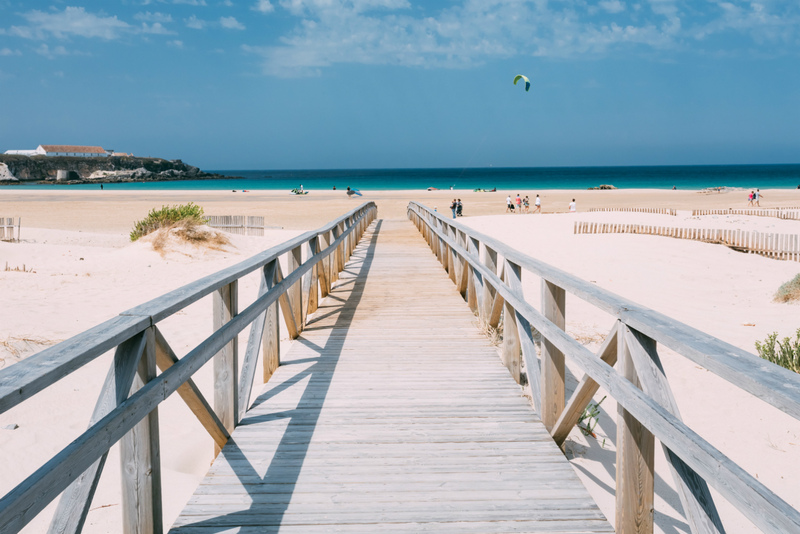 Although Tarifa does not have its own airport there is a selection of airports nearby to choose from, such as Gibraltar, Malaga, Seville or Jerez de la Fronterra. Tarifa does have a good bus system accessible from many popular towns and cities such as Malaga and Cadiz and Seville. It also has a ferry system running to and from the Moroccan port Tangier city regularly. Since Tarifa is a tourist destination, there are many beautiful places to stay to make the most out of a trip to this warm beach town. There are bed and breakfasts (great for romantic getaways), vacation rentals (which are perfect for extended vacations), and there are many hotels to choose from. Some of these hotels include Hotel Misiana, Apart Hotel Koala Tarifa, and Meson de Sancho. Many of the hotels in the town of Tarifa have the beautiful architecture and building design that Spain is known for. There are no shortages of activities and things to see and do in Tarifa. If you fancy learning to fly a kite or kitesurf, Tarifa has a special school that offers instruction in both of these activities. There are whale and dolphin watching tours available with the organization firmm (foundation for information and research on marine mammals), and Tarifa is a great city to sit down somewhere nice and do some bird watching, as well. For film buffs, Tarifa is the home of the African Film Festival. Take a dip in the beautiful ocean, try your hand at surfing, or just walk along the streets of the town and take in some of the breathtaking sights that Tarifa is known for.